RPF Notification (Previous) for Women Constable Posts, RPF Notification 2016 for 2030 Women Constable Posts, SCR Secunderabad Notification 2016 for Women Constable Posts in RPF/ RPSF. South Central Railway Secunderabad has published a notification on 30.01.2016, for the post of Women Constables in RPF/ RPSF. 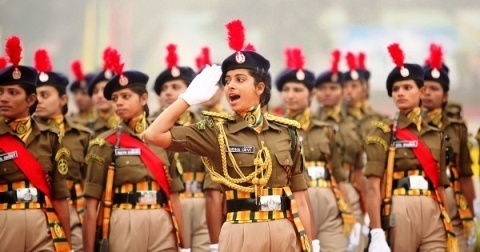 South Central Railway (SCR) Secunderabad has issued online applications from eligible Women Candidates for filling up the Constables Posts in Railway Protection Force/ Railway Protection Special Force. The total number of vacancies are 2030. All eligible women candidates are required to apply through Online mode only, except for the state of J&K, North-Eastern States, Border Guarding Districts (remote ares) and left wing extremism (LWE) affected districts of the country where the candidates will have the choice to apply in Online/ Offline mode. Before applying, candidates are advised to go through the instructions available on the notification. Candidates are required follow the steps and fill your online application form completely. Note : Candidates are advised to indicate their active mobile number and valid e-mail ID in the ONLINE application and keep them active during the entire recruitment process as important messages will be sent by email and on mobile which will be deemed to have been read by the candidates. Interested candidates must have passed in 12th Class/ Intermediate from recognized board. For more details refer the advertisement. Applying candidates age should be between 18 and 25 years. Age relaxation is applicable as per Govt. rules. RRB Secunderabad Group D Online Application 2018 at secunderabad.rrbonlinereg.in/, RRB Group D Online Application Procedure 2018. RRB Group D Exam Dates & Schedule 2018. The Railway Recruitment Board, Secunderabad has invites online applications from eligible candidates for recruitment to the posts of Group D. The posts covered are Trackman, Gateman, Pointsman, Helpers in Electrical/ Engineering/ Mechanical/ Signal posts. All over India, the total number of vacancies are 62,902. Total number of posts in the RRB Secunderabad Region is 6,523. Last Date for submission of RRB Secunderabad Group D Online Application is 31.03.2018 at 23.59 Hrs. Recently, Railway Recruitment Board, Ministry of Railways has announced certain modifications of Age, Exam Fee etc. Accordingly, the revised online application with the modified eligibility shall be made for submission of application from 28.02.2018. Now, the closing date for submission of online application shall stand extended to 31.03.2018. Please note that the candidates can apply more than one RRB, it will be rejected. It will open an new webpage, candidates should enter their basic details like Name, Date of Birth (DOB), Father Name, Mother Name, Educational Qualification details i.e, Roll number and Year of Passing, Mobile number and E-mail ID etc. Please note that both the E-mail ID and Mobile number used for registration must be yours and unique. An OTP will be sent for confirming the registration of the candidate. 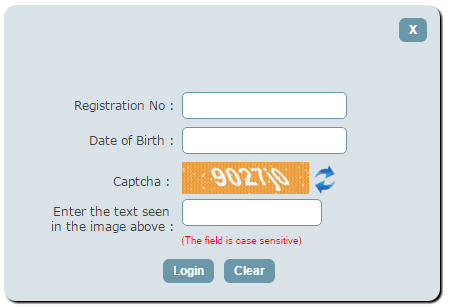 After entered the registration details, then click on ‘submit’. An OTP will be sent to your registered mobile number and e-mail id, then click on ‘Verify through OTP’ then enter the OTP number. After validation of both the OTP’s, the registration number will be generated and displaced. Also the registration details will be sent to your email id and mobile number. Candidate can proceed with the online application by clicking on the ‘Candidates Login’ on the home page by using the registration number and date of birth. In that page candidate needs to enter his personnel details link religion, educational qualification, gender etc. Pay the application fee through online i.e, Net Banking/ Credit Card/ Debit Card. Candidates can also pay the application fee through off-line i.e, SBI Bank Challan/ Post Office Challan Form. Upload your scanned photograph, date on it (i.e, photo captured date, not date of birth) and SC/ST Certificate (if applicable) should be jpg/jpeg format only with 100 DPI. Photograph size 20 KB to 50 KB and certificate size 50 KB to 100 KB. Once again check your details completely and then submit the application form. Take print out of your application form. RRB Secunderabad ALP Online Application 2018, RRB Secunderabad Technician Online Application 2018 for ALP Posts, Railway Recruitment Board ALP Notification 2018 Apply for 26,502 Posts. The Indian Railway Recruitment Board was issued an employment notification for recruitment to the post of Assistant Loco Pilot (ALP) and Technician Categories on 03.02.2018. All over India, the total number of posts are 26,502. Now, the Railway Recruitment Board, Secunderabad, invites RRB Secunderabad ALP Technician Online Application from eligible candidates for the posts of Assistant Loco Pilot and Technicians, for filling up of total 3262 in SCR (South Central Railway). Recently, Railway Recruitment Board, Ministry of Railways has announced certain modifications of Age, Exam Fee etc. Now, the closing date for submission of online application shall stand extended to 31.03.2018. 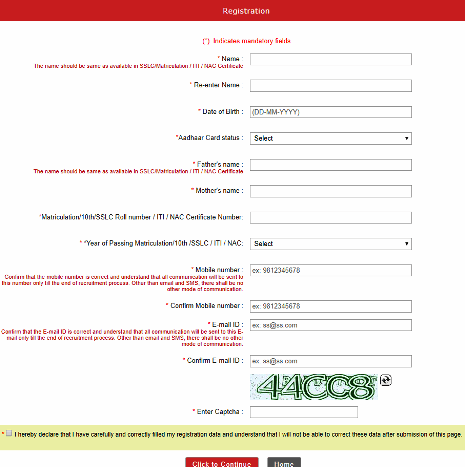 Fill in the basic details such as, Name, Father Name, Date of Birth, community, e-mail address and mobile number etc. Candidates are advised to follow the instructions and complete the registration process step-by-step in order to get a Registration Number & Password to your entered mobile number/ e-mail address. 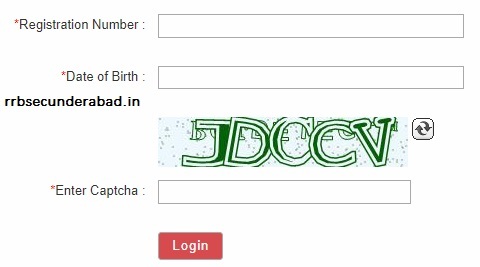 login once again by using the Registration Number and Password, to proceed for the next step. Fill up other details such as education qualification, etc. Based on the educational qualification of the candidates, the eligible post(s) matching the qualification would come up. Candidates are required to indicate their priority/ preference for the category/ post. 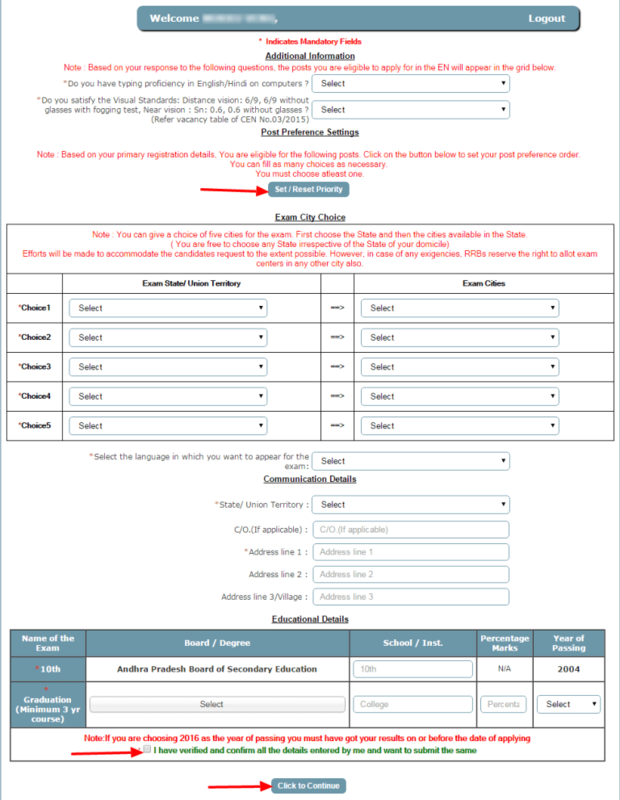 Candidates are also required to select any of the exam centers given in five cities from the drop down menu for appearing in Common Based Test (CBT). Then, pay the examination fee Rs. 500/- in the case of general and OBC candidates through Debit card/ credit card/ internet banking. Examination fee can also be paid through SBI branch/ any computerized post office after downloading a pre-printed challan / pay-in-slip. Upload your recent color photograph (of size 3.5 cm X 3.5 cm, 15kb – 40kb, 100 DPI) in JPG/JPEG format. Candidates belonging to SC/ST need to upload scanned copy of their SC/ST certificates (JPG / JPEG format, 50 kb – 100 kb) and also for availing the facility of free travel facility (Second class railway pass). After completion, submit the application form and take printout of the acknowledgement for records. Only a single online application should be submitted by the candidate. There will be a Common Computer Based Test for all the notified categories of posts. 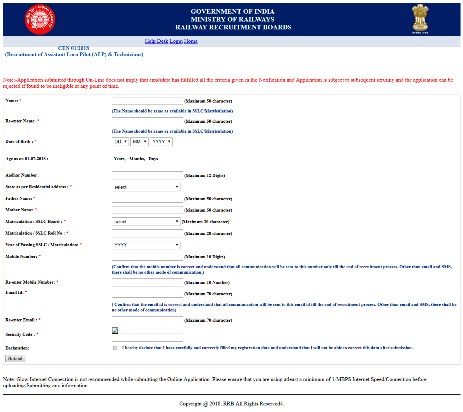 Once the dates for submitting online applications are announced by RRB Secunderabad we would post the same on our website. Keep visiting our website for updates.